This is a story about sacrifice…death…love…freedom. This is a story about forever. Haven Antonelli and Carmine DeMarco had vastly different childhoods. Haven, a second-generation slave, grew up isolated in the middle of the desert, her days full of hard work and terrifying abuse. Carmine, born into a wealthy Mafia family, lived a life of privilege, never having to answer for anything he did. Both now seventeen, a twist of fate causes their worlds to collide, making them question everything they ever believed. Entangled in a web of secrets and lies, they learn that while different on the surface, they have more in common than anyone would think. In a world full of chaos, where money and power rule, Haven and Carmine yean to break free, but a string of events that started before either were born threatens to destroy them instead. Murder and betrayal are a way of life, and nothing comes without a price–especially not freedom. How much will they have to sacrifice? Can they escape their pasts? And, most of all, what does it mean to be free? Not everything is as it seems, and no one can possibly come out unscathed, but maybe, just maybe, it’ll be worth it in the end. 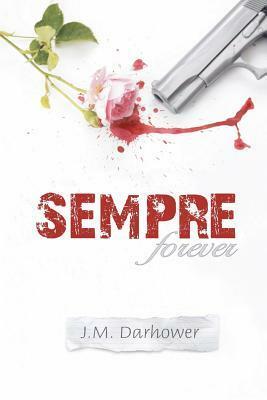 I read Sempre after I read my friend, Elena, review of this book over at Bookish Temptations. Just like Elena I love the title, it’s simple yet captivating. Another thing that drawn me to read Sempre is the modern day slavery theme. I always appreciate authors who expose this kind of issue in their books, and they certainly have a special place in my heart. So, I dedicated this review to J.M. Darhower and Elena. To say that Sempre is an amazing story is an understatement. Haven and Carmine love story is both sweet and heartbreaking. They were two people who grew up in two very different worlds but thrown together to find freedom, love and meaning in their life through each other. Haven is a remarkable character and I’m very impressed by her. She has lived her entire life as a slave, she grew up isolated in the middle of a dessert along with abuse and cruelty and yet she has a loving, patient and caring personality. My heart broke for her so many times over, but I love watching the self discovery and seeing her grow into herself. Carmine was, how do I put this delicately, he was a jerk and a manwhore. That is until he met Haven. Seeing someone you love die at a very young age would defintely make you a mess and that is what had happened to Carmine. Despite his wealth and good physical features, he was a broken kid that still hunted by the guilt and remorse from her mother’s death. When he met Haven there was an immediate connection between them. Haven made him rediscover the part of him he thought had died with his mother and Carmine helped her adjusting with her new life and fight for her freedom. I’m impressed by how Carmine evolves from a spoilt selfish teen through his love for Haven into a man who is willing to make a huge sacrifice for her and that is ultimately what this novel is about – sacrifice. J.M Darhower does an amazing job at developing the characters; giving us readers reasons to fall in love with them and the necessary background information that helps to explain a lot at the end. She also made this book purposeful, not only to provide entertainment for readers but also enlighten us about modern day slavery and human trafficking. In conclusion, Sempre is a powerful novel. I highly recommend this book for your TBR list.